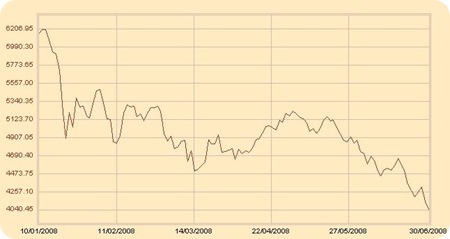 2008 has been very…very unkind to investors in the Indian stock Market. The index has dropped 33 per cent this year, its worst six months since the benchmark’s introduced in 1979. The overall market capitalization has plunged by a third or about Rs 23 trillion during this year from a peak of over Rs 72 trillion, that started after the benchmark Sensex had breached 21,000 points mark on January 11. Out of this, close to 60 per cent loss has been in the promoters’ kitty themselves, with their holding depreciating by about Rs 16 trillion. Foreign institutional investors (FIIs) have been the biggest investor class in terms of their share in the total market loss. The market barometer Sensex fell by nearly 8000 points from an all-time peak of 21,206.77 on January 10 to settle at 13,461.60 today. Sensex lost close to 1000 points in last Friday’s and today’s session. Two companies alone Reliance and DLF have seem their market value eroded by more than whopping 1.2 trillion rupees. The 2 big questions now are – Will Indian markets revive? and if they do when ? Having said all this, I think markets are oversold, investors with strong heart and money (if they have anything left) should put in. I am hopeful markets will come back in next 8-12 months.